Banner advertisement to maximize your ad revenue from visiting users. The plugin allow registered users to select & add the advertisement banners and/or advertisement script like Google Ads, Video embed etc. Site admin can manage, change, and remove from wp-admin easily. The WooCommerce Plugin should be installed if you want users to purchase the banner space from front side. Display banners for each individual pages (eg: home page, each category & tags pages, ads, blog post and content detail pages ). The plugin is for ClassiPress Theme for Advertisement by AppThemes. Site admin can manage banner spaces to be display on front end via plugin settings page from wp-admin. We have added maximum possibility of display advertisement via the plugin and easily show/hide by plugin settings. If you have 100 pages on your site so you have possibility to display ads is 100 multiply by the banners spaces you have selected. Just like if you have selected above & below header banner, above & below footer banners & above and below sidebar banners so total is 6 banners. So now you have total banner spaces to buy for users is 100 multiply by 6 (100 x 6) equal to 600 banners you can display for you complete site. Of cause the banner position value(price) will be common for all 100 pages like if you have create a product for $10 and selected for above & below header, for whole ads detail pages while any buyer going to buy the ads banner space he will charged $10 only. Like wise if you want different banner space price for above & below footer, you should create new product and manage settings from plugin settings to charge the price as per you decided. Initially the plugin have common price selection and settings options. Like currently there is only one option to display default banner on above header space for whole site. Same way all other options are same so price value for all pages for particular banner space will be common for whole site. So if the plugin is on demand, that time we will plan to add different settings options for home pages, listing pages and detail pages. So the site owner can change the banner space price for home page, listing pages and detail pages. Display banners for each pages. 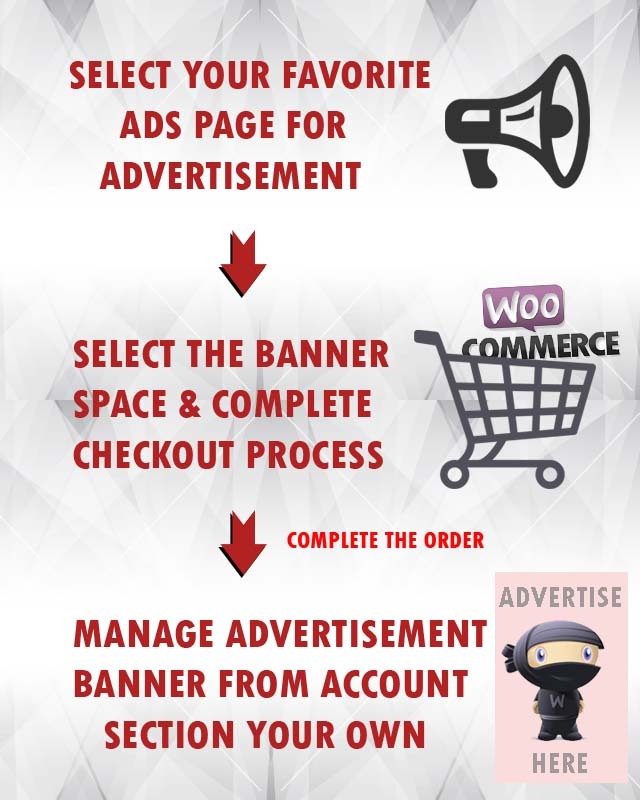 Users to buy banner space via WooCommerce Plugin. Banner space charges managed by admin. Individual banner size settings. eg: different width X height for each space as per required. Different Banner spaces for pages. Admin can see the orders(revenue) and manage report (like all features of WooCommerce). Admin can set the default advertisement if there is no banner to display. As soon as order approved user can manage the advertisement banner from “My Account” page. Cron job feature to refresh new banners and expired banner management automatically. Expiry days settings for each banner spaces. Display multiple banners on same space buy sliding effect. Image media uploaded and selection for front end users.